We chant the traditional Tibetan tunes that are said to come from the dakinis and bless one’s mind-stream. This offering ceremony is rich in symbolism, and includes lineage prayers, bath offering, re-taking one’s vows, chai tea with dedications, and Tsog offering. Everyone is welcome at this epic version of the Guru Puja – it is a profound yet joyous spiritual celebration! This is a special offering to the gurus, made on the Tibetan 10th and 25th each month. Reliance on our spiritual teacher is the foundation of all spiritual progress. 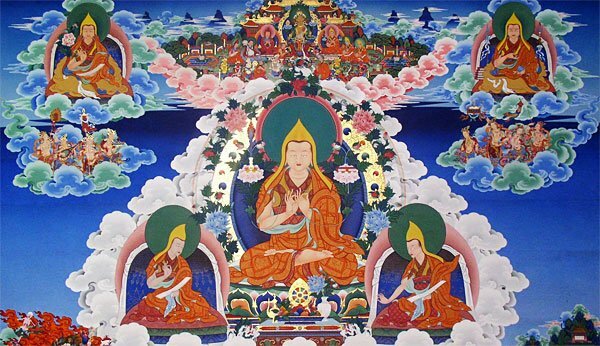 In the puja we pay homage to the lineage lamas and their vast qualities. The puja contains the whole path to enlightenment and creates a powerful potential of spiritual growth for the participants.